CRAMBA’s January 2019 Board Meeting was held on Thursday, January 10, 2019 at Shelby Township Fire Station #1 at 7pm. This was a joint meeting with the Addison Oaks Race Committee. Meeting was called to order with Brian McPherson, Roger Class, Wade Robbins, Steve Vigneau present for the CRAMBA Board. (Ivan Krasnov and Mike Reeves were excused absence.) Also present were Jeremy Verbeke (National Mountain Bike Patrol, River Bends Trail Coordinator) and Chris Westerlund (Addison Oaks Fall Classic Race Organizer, Membership Committee Chair). Chris Westerlund has introduced both Business and Club support for CRAMBA, at $100 and $50 each, respectively. Metro Detroit Mountain Bikers and Guinness Bikers are two of the first supporting organizations. Steve Vigneau is working on new water bottles. We are currently out of stock of water bottles. Steve Vigneau has been working with Stephen Spry on stocking hats to be sold at Ay CRAMBA. The order is under way and delivery expected at the end of January. Brian McPherson handled Massive Fallout in 2018, but may not have the resources to run it all this year. Wade Robbins and Brian will be working on this together in 2019. Trail marking supplies as requested by TCs will be delivered 11-Jan, Steve will kit the orders up and make them available to TCs. Jeremy Verbeke is working with Shelby Township on mitigating local resident concerns about the proximity of the newest phase of the CK Canal Loop at River Bends Park. Requested changes will result in a loss of ~200′ of trail, but will maintain a visual barrier between a local neighborhood and the single track. Roger Class is looking into new venues for the Chapter Membership Meetings. Brian and Steve are meeting with Gary Hopp at Stony Creek Metropark on Saturday, January 5, 2019 to discuss fat bike access to the single track. CRAMBA is considering a new route that’s more of a loop with an alternative first climb. Makes for a better hole shot and no two way traffic. Chris will be taking this up with the park. Food planning for the race is a concern, due to lack of volunteers. Sponsors are currently being pursued, much earlier this year than in the past. First National Ski Patrol (NSP) training for National Mountain Bike Patrol members is 30-Mar-2019. NMBP new member orientation will be held in April, 2019. Board members present at the meeting were Brian McPherson, Steve Vigneau, Wade Robbins, Roger Class, and Mike Reeves. The meeting was called to order at 7:05 by Brain McPherson and approximately 38 people were in attendance. Steve Vigneau talked briefly about the purchase of the Snowdog Trail Groomer for $4300.00. The old snowmobile is to go to Holdridge for the Wilderness loop and the old groomer is likely going to Addison Oaks. Several of our CRAMBA trails purchased signage and those signs should be in this Friday (1/11/19). Jeremy Verbeke stripped the CRAMBA trailer of the old outdated wrap, and put our new CRAMBA logos onto the trailer. It looks great, thank you Jeremy. Stony Sheldon Trails redevelopment update. CRAMBA and the Metro Parks have been working together for a few years to redesign the trails at Stony Creek. Applied Trails Research out of State College Pennsylvania, put together their proposal for the project and we are waiting for final approval. The design should begin in the spring and the build should be done by the end of 2019. The trail will be a series of linked, loops, that increase in difficulty. Much of the old trail will be retained, some of the difficult to maintain sections will be eliminated. Keeping the skills area is something CRAMBA is trying to workout with the park. It is ultimately the parks decision to make, CRAMBA is trying to give them options to keep it if they ultimately choose to do so. Bike Patrol update from Jeremy Verbeke. Transition to National Ski Patrol is about halfway complete. The 2019 roster is down to 35 from 70. Out of the 70 patrollers last year, only 39 were active. The rest either did not patrol, or did not report their patrols. March 30 is the first training for non-ski patrollers on the roster. April 13 is the training date for new patroller. Any questions, or if you are interested in bike patrol, email Jeremy at bikepatrol@cramba.org. Ay CRAMBA It’s Cold Out is scheduled fro February 2nd, 2019 at noon. It’s the 6th Anniversary of the event, which is a great opportunity to come out and test ride fat bikes at River Bends. If the conditions aren’t good, the makeup date is set for February 16th. We will have CRAMBA stocking/ski hats for sale at the event for $20. 40% of the hat proceeds go back to CRAMBA . Also KLM will be sponsoring a membership drive at the event, covering $20 of the fee. The fall 2018 membership drive was very successful. We are at 413 members currently. November was the best membership month CRAMBA has ever had. Also, family memberships are the same price as individual memberships. So, go to the website and add your family members. This will assist us with our overall numbers. “Strength in numbers” very much applies with advocacy. The Addison Oaks XC Race will be held on September 8th, 2019. This year it very well may be the last race of the CPS series. Waiting final confirmation of the CPS Schedule, hopefully later this month or in February. Massive Fallout will be the last weekend of September. We will need volunteers to mark the route, and someone to lead the project. We will be working with the local parks and communities to hopefully have more permanent signage put up, to make the prep for the ride every year easier. River Bends will be having its first ever Mountain Bike Race. It will be a kids MISCA race. CRAMBA is very excited about this. CRAMBA has only assisted with route suggestions for the race, and is not officially hosting the event. Go to MISCAbike.org if you have kids interested in racing. Steve Vigneau offered his Treasurer’s Report. Our current balance is at $32,320. This is after the $3,200 for signage at Pontiac Lake, River Bends, Bloomer, Stony Creek, and the Clinton River Park Trail. This balance also includes the $4,300 for the snowdog. CRAMBA received a $500 donation from the MOVE IT Fitness organization. Big thank you to them! The big upcoming expense this spring is our annual insurance payment of around $6,000-$7,000. The Addison Oaks race brings in around $6,000 annually. We have been fortunate and have had good weather, and a good turnout most years. If we have a bad year we would lose a significant portion of our income. It is important to remember that we need to keep a “cushion” for possible situations like this. Roger Class stated that Addison will be groomed when we finally get snow. Columbus Park is continuing to tweak the single track when they can. Weather and conditions are not cooperating at the moment. Pontiac Lake is receiving new signage, and the new changing station project is moving along. Plans have been submitted to the park management and we have a good lead on funding (possible corporate donation). River Bends has work progressing on the new CK Canal Loop (red). 1.6 miles were added over the summer of 2018, and another 1.1 miles is ready to be built out. @ new bridges were built with a donation received by Wade Robbins. A couple residents have complained that parts of the new trail comes to close to their property. The trail is 60-80 feet from their property, and has a rail road track and bed between their property and the trail. Jeremy is working with Shelby Twp to come up with a solution to make everyone happy. Watch for trail days to be listed on Facebook. We are working with Stony Creek to find a way top allow fat biking at Stony Creek. Stay tuned. Holly High School trail is still available to ride, and plans are made for 8 miles of trail to be built in Lapeer. This trail will be near the jail/prison, the DTE solar panel field, and I-69. Posted in Chapter Meetings, Meeting minutes	| Comments Off on January 2019 CRAMBA Membership Meeting. Sorry this is so late getting posted. I got busy with the holidays and forgot to post. The meeting was called to order at 7:05 pm at Steampunk in Utica. Attending the meeting were Steve Vigneau, Wade Robbins, Brian McPherson, and Mike Reeves. Finances for the chapter have been set up on Quickbooks and our balance as of 12/13/18 was $34,958.92. Snowdog Groomer has been purchased and we are still awaiting snow. Stony plan is in, and they are working on final approval. MMBA Seven Lakes Project- MMBA was given $20,000 for the project. The money was not set aside as directed, and was spent. Jason Aric Jones was working on the project and has stepped down after the MMBA ‘s mismanagement of funds. The January membership meeting will once again be held at CK Diggs. We are aware of the difficulty for us to hear last time, so we have worked with the owner of CK Diggs and we have a microphone set to run through the speakers in that room. This should solve the problem. Meeting was adjourned at 7:50 pm. Happy New Year from CRAMBA to you and your family! We hope you’ve had another great year of riding and having fun on the trails. 2018 was a great year for CRAMBA and we want to share with you some of the big things we accomplished together. Keep our trails in great shape and ready for all to use. Build and install an information kiosk and bike repair stand at the Pontiac Lake trailhead. Reroute a chronically muddy section of trail at Pontiac Lake. Build a banked-curve, walled S-bridge at Clinton River Park Trailsover a perpetually muddy area. Add 150 yards of new trail at Clinton River Park Trails to avoid an old dump and make for a more fun climb/descent. Donate $3000 to support Shelden Trails Redevelopment at Stony Creek Metropark. Purchase a SnowDog tracksled for grooming snowy single track for fat biking. Open the first phase of the CK Canal Loop at River Bends featuring three beautiful, sustainable bridges over wet spots. Replace missing trail markers at Bloomer Park, and bring on new volunteer Co-Trail Coordinator Chris LaBaere. Raise $5855 at the Addison Oaks Fall Classic! Host the annual ¡Ay CRAMBA It’s Cold Out! winter fat bike party at River Bends Park. Host another episode of Massive Fallout, our annual autumn multi-trail ride spanning Stony Creek, Bald Mountain, Bear Creek, and Addison Oaks. Continue work with the Metroparks and Applied Trails Research on the Shelden Trails Redevelopment Project at Stony Creek Metropark, resulting in the concept design for new trails! We’re looking forward to continuing our work in 2019, starting off with grooming trails for fat biking, hosting another ¡Ay CRAMBA It’s Cold Out! event, donating new signage to a number of the trail systems we support, continuing work on the Shelden Trails Redevelopment at Stony Creek, and doing our best to enhance mountain bike access to trail systems throughout Southeast Michigan! Please join us for our next Chapter Membership Meeting happening next Tuesday, January 8th, at 7pm at CK Diggs in Rochester Hills! Then, we hope to see you at ¡Ay CRAMBA It’s Cold Out! happening on Saturday, February 2nd, at noon at River Bends Park. Click here for more information. Stony Creek Shelden Trails Redevelopment Concept Design Announced! You wrote, you showed up, you donated, and the Metroparks listened. The concept design put together by Applied Trails Research for the Shelden Trails Redevelopment Project at Stony Creek Metropark has been approved by the Metroparks Board of Directors! So what’s next? CRAMBA will continue working with the Metroparks to support the design, construction, and maintenance of these new loops. We hope for construction to begin late Summer of 2019! Posted in Chapter News	| Comments Off on Stony Creek Shelden Trails Redevelopment Concept Design Announced! New Board Positions are as follows; Brain McPherson Chairperson, Vice-Chairperson Roger Class, Treasurer Steve Vigneau, Secretary Mike Reeves, and Wade Robbins and Ivan Krasnov will be Members-at-Large. Trail Section Adopter Program (TSA) is a program that we are considering implementing on a trial basis. It is a program that would have several different people responsible for different sections of trail, and overseen by the Trail Coordinator for that particular trail. Poto has done something similar in the past. Pros and Cons of this program were discussed, more to come in the future. The Howlin’ at the Moon event at Stony Creek has been moved to the spring time. We will let everyone know when a date is set. Stony Creek has a new Co-Trail Coordinator. His name is John Huff and will be focusing his efforts on the Skills Park that is in much need of some attention. Ay CRAMBA It’s Cold Out! February 2nd 2019 at River Bends. Bike shops will be at the event with Demo bikes to ride. Uncle Peter’s Pasties and Fries will be on site. Beer and wine is allowed at River Bends, but remember liquor is not allowed. More to come on this event as things develop. Thank you to Jeremy Verbeke for working hard on the tool trailer and getting new decals on it. 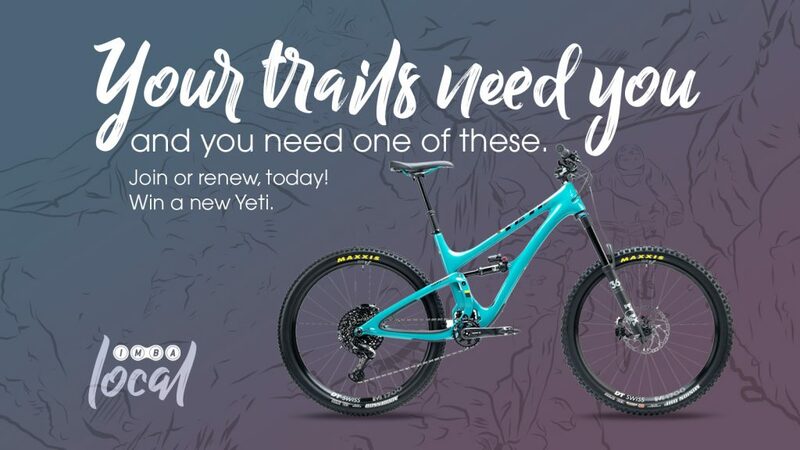 Join or renew CRAMBA in October and you’re entered to win a Yeti Cycles SB5 or SB5 Beti C-Series GX kit, plus a $2,000 JensonUSA shopping spree, a Western Spirit cycling trip for two and a BikeFlights shipping voucher for two. October 2018 CRAMBA Membership meeting at Ck Diggs in Rochester Hills. The meeting was called to order by Steve Vigneau at 7:15 pm. Board members present at the meeting were Steve Vigneau, Kristen Barry, Brain McPherson, and Mike Reeves. Applied Trails Research is finishing up, and will be seeking approval later this year. The project is estimated to run around $250,000. Howlin at the Moon event is coming up at 6:30 on 10/27/18, bring lights. It is a fundraiser for the new trail project. It includes something for all the major user groups. Hiking, Running and MTB. We are looking for volunteers to lead rides by people that are familiar with the Sheldon Trails. The race was successful even with the threat of poor weather. Around 300 racers entered the event and is our major fundraiser for the chapter apart from the dues and individual donations. The race generated around $6,000 for the chapter. A new start finish route was utilized this year and it worked out great. This event is coming up February 2nd with 2/16 has a make up day. It is a demo day with local shops being on site at River Bends. We are in search of volunteers for this event. Please contact Kristen Barry if you are interested in helping out. Brian McPherson spent a lot of time setting up the course due to a lack of volunteer support. The weather was not good and Brain stated that only 4 people actually completed the whole route. Despite the weather there was a pretty big turn out considering the weather. Next year we may try and coordinate Massive Fallout with the Rochester Octoberfest. There are some logistical struggles such as parking. If you have ideas please consider coming to the January membership meeting and sharing, or contacting a board member. Chris Westerlund reports we have around 450 paid members at the moment. Please renew your membership. The IMBA is sponsoring a membership drive where you can win a Yeti Kit plus a $2,000 JensonUSA shopping spree, a Western Spirit cycling trip for two and a bike flights shipping voucher for two. This is good for the month of October only. Kristen states that we are in good shape financially with about $36,000 in the bank with no further major expenses coming up this year. Last year at this time we had about $30,000. As a board we decided to set aside $10,000 for trail improvements. We let the various trail coordinators know that they could have up to $1,000 for projects, and to let us know. We have around $12,000 a year in operating expenses which includes such things as $7,600 for insurance ($1600 for race and $6000 for chapter insurance), and $600 for the storage unit. Working on an agreement with the park that will allow us to have large scale trail days, above and beyond the great work that Paul does out there. They are going to try and improve the trail grooming process this winter, so look for groomed fat biking at Addison this winter. There will be a fall project, not sure what it is yet, so more to follow. Continuing to try and peacefully coexist with the other trail users and making sure all parties are happy. Looking to for a volunteer and a truck to pickup a large amount of flagstone and bring it to the park. everything is going good at CRPT and look for improved signage in the near future. Approximately 1 mile of new trail and continuing to work with the park for more trail. New CK Loop about half done and will hopefully be completed this fall. The temporary bridge accessing the new loop will be replaced soon and will be about 6 feet wide with railings. The new loop will also be included in the fat bike grooming process this winter. The major Sheldon Trails Project is really the only news here. Make sure the particular park is open for night riding. And if you are riding backwards please yield to the riders going the standard direction. No report from Jeremy Verbeke at this time. However we ill report that Jeremy passed the medical certification process and is the mountain bike patrol director. This transition is on going and look for more news in the future. Steve Vigneau can no longer be the chairperson (Term limited), but will be staying on the board in come capacity. Kisten Barry can no longer be the treasurer (term limited), and will be stepping down from the board and will be the CRAMBA volunteer director. Mike Reeves and Brian McPherson will also be staying on the board. Eric Mile will be stepping down from the board. Thank you to Wade Robbins, Ivan Krasanov, and Roger Class who volunteered to be on the board. Massive Fall Out is upon us! Hope to see a lot of riders at MFO tomorrow morning! The trail marking is being finished as I type, and folks are preparing food and drink as well. Keep your fingers crossed that the weather holds. Please remember the running event at Bloomer Park, and give them some space. Also, please be careful riding past the Rochester Library, watching for pedestrians. Posted in Chapter News	| Comments Off on Massive Fall Out is upon us!